Great for Glass, counter tops of all kinds, vinyl seats, glass and clean bathrooms. Trimaco's Wonder Rag is made of a unique microfiber material that is strong and multipurpose. They are great for removing spills and splatters, polishing and cleaning all surfaces. 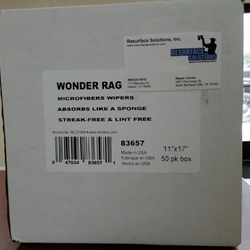 Both streak-free and lint-free, Wonder Rags are pre-washed for softness and absorbency.